JOLIE MANUAL BREAST PUMP It has a top expressing action, a soft silicone cushion and a smooth-action, ergonomic lever. With its attractively designed breast milk container, it is a real multi-talent: after being expressed, the milk can be stored, frozen, or warmed in it and then baby can even be fed directly from it. 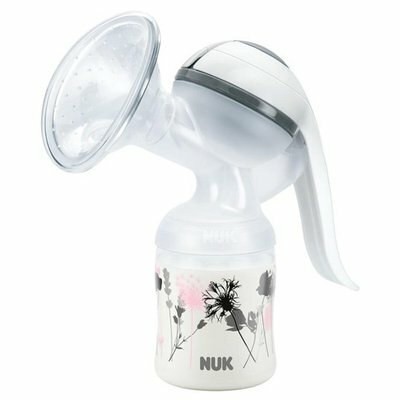 The NUK Jolie is BPA free and “Made in Germany”. Soft, textured silicone cushion gives a pleasant massage that encourages the milk to flow. Smooth action, ergonomic lever for easy use. Just a few parts for quick assembly and easy cleaning. Sturdy, dishwasher resistant - ”Made in Germany“ quality. Modern and appealing flower motif. Easy to assemble and clean, dishwasher safe.